IBA Centre for Excellence in Islamic Finance is pleased to o¬ffer a one-day advanced level course on development of real estate indices. Housing Finance comprises of the largest segment of consumer finance with Islamic Banks having 70% share of the market. 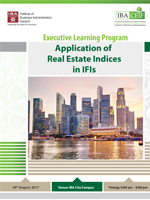 The course is designed to apprise the participants with the global advancement in development of real estate indices and their potential use as an alternative for benchmarking. The course is enriched with cases from various jurisdictions to provide hands on learning to the researchers and professionals. Dr. Sheharyar Bokhari is a Researcher at Massachusetts Institute of Technology (MIT). He holds a MA in economics from Tufts University and a PhD in urban and real estate studies from MIT. Dr. Sheharyar was part of the development team that pioneered the first commercial property price indices in the USA, known as Moody's Commercial Property Price Index.